Configure and select files as you would normally. At “First Sample Time/Depth” choose Constant, with a value of 0. Expand the Advanced Mappings panel. Uncheck the “Hide fields with no value” box. Confirm that the value range is sensible. Complete the SEG-Y load and output the dugio volume. Add the new volume to the session. b. 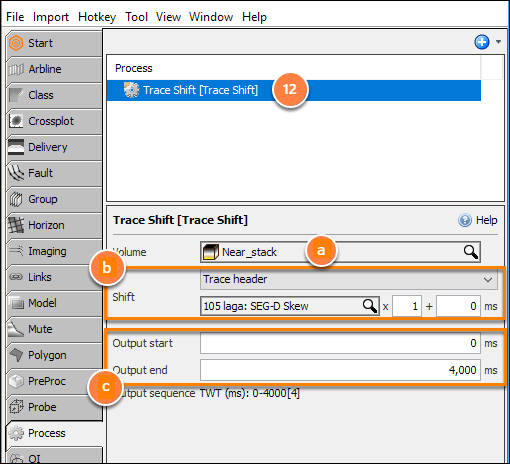 Shift: Choose “Trace Header” and select the advanced mappings header containing the start time, e.g. laga. c. Update the output start and end values to include the full length of the shifted traces. Next: My data loaded successfully. Why can't I see anything?